Members of the human epidermal growth factor receptor (HER) family play a significant role in bladder cancer progression and may underlie the development of chemotherapy resistance. Dacomitinib is an irreversible tyrosine kinase inhibitor with structural specificity for the catalytic domains of epidermal growth factor receptor (EGFR), HER2 and HER4 that has exhibited vigorous efficacy against other solid tumors. We evaluated the antitumor activity of dacomitinib in human bladder cancer cell lines expressing varying levels of HER family receptors. These cell lines also were established as bladder cancer xenografts in nonobese diabetic/severe combined immunodeficiency (NOD/SCID) mice to assess dacomitinib activity in vivo. Significant cytotoxic and cytostatic effects were noted in cells expressing elevated levels of the dacomitinib target receptors with apoptosis and cell cycle arrest being the predominant mechanisms of antitumor activity Cells expressing lower levels of HER receptors were much less sensitive to dacomitinib. Interestingly, dacomitinib was more active than either trastuzumab or cetuximab in vitro, and exhibited increased growth inhibition of bladder tumor xenografts compared with lapatinib. Pharmacodynamic effects of dacomitinib included decreased E-cadherin (E-cad) expression, reduction of EGFR and extracellular signal-regulated kinase (ERK) phosphorylation and reduced mitotic count. Dacomitinib also inhibited tumor growth in a chemotherapy-resistant xenograft and, when combined with chemotherapy in a sensitive xenograft, exhibited superior antitumor effects compared with individual treatments. Evaluation in xenograft-bearing mice revealed that this combination was broadly feasible and well tolerated. In conclusion, dacomitinib exhibited pronounced activity both as a single agent and when combined with chemotherapy in human bladder cancer models. Further investigation of dacomitinib in the preclinical and clinical trial settings is being pursued. Supplementary material is available for this article at https://doi.org/10.2119/molmed.2013.00108 and is accessible for authorized users. In the last two decades there has been little progress in the development of systemic therapies in bladder cancer, and the identification of new and effective treatments is critically needed. The human epidermal growth factor receptor (HER) family (epidermal growth factor receptor [EGFR]/HER1, HER2/ErbB2, HER3/ErbB3, HER4/ErbB4) is an important group of receptor tyrosine kinases (RTK) that regulate cell proliferation, migration and survival (1, 2, 3, 4). There are no known ligands of HER2, while HER3 has inactive kinase domain (5). Overexpression of HER family members and activation of downstream signaling pathways have been implicated in the development and progression of several human cancers, including bladder cancer (1,6, 7, 8, 9). EGFR and HER2 overexpression has been correlated with higher grade, stage, disease progression and shorter survival in bladder cancer patients (10, 11, 12, 13, 14, 15, 16). Data suggest that HER-downstream signaling is associated with progression of bladder cancer and the development of resistance to chemotherapy (9,17, 18, 19). Two recent studies utilizing next-generation sequencing and comparative genomic hybridization reported mutually exclusive amplification of EGFR and HER2 genes in a number of human bladder cancer samples, suggesting a biologically functional role (20,21). Preclinical studies support the use of HER inhibitors (17–19, 22–24); however, these compounds have not exhibited meaningful clinical efficacy in patients with bladder cancer (25,26). Dacomitinib is a potent and irreversible tyrosine kinase inhibitor that is highly specific for the catalytic sites of EGFR, HER2 and HER4 and is currently under clinical development in the management of several solid tumors (27). Dacomitinib is orally active and considered to have greater bioavailability, longer half-life, larger volume of distribution and lower clearance compared with first generation inhibitors of this class. This compound had activity in gefitinib-resistant non-small cell lung cancer (NSCLC) in vitro, prolonged progression-free survival in NSCLC patients and is in phase III trials (NCT01360554, NCT01774721) in advanced NSCLC (28,29). Dacomitinib was shown to enhance the effect of chemotherapy (gemcitabine, cisplatin) in gastric and biliary adenocarcinoma models, and to overcome resistance to HER2-targeting agents in breast cancer models (30, 31, 32). Considering the role of the HER family in bladder cancer, we evaluated the antitumor activity of dacomitinib in preclinical models of human bladder cancer, examining its effects on phosphoprotein signaling and mechanisms of antitumor activity. We also compared the activity of dacomitinib to other HER-targeting agents, and to gemcitabine-cisplatin chemotherapy. Herein, we report the initial study evaluating the antitumor activity of dacomitinib in human bladder cancer. Dacomitinib was provided by Pfizer (New York, NY, USA); cetuximab was provided by Eli Lilly (Indianapolis, Indiana, USA); trastuzumab, cisplatin and gemcitabine were provided by the University of Michigan Comprehensive Cancer Center Pharmacy; and lapatinib was purchased from LC Laboratories (Woburn, MA, USA). Human bladder cancer cell lines (UM-UC-3, UM-UC-6, UM-UC-9, UM-UC-13 UM-UC-14, were obtained from H Barton Grossman (MD Anderson Cancer Center, Houston, TX, USA). Human cell lines RT4, T24 and 5637 were obtained from the American Type Culture Collection (ATCC; Manassas, VA, USA). Characterization/authentication of all these cell lines was performed within 6 months of the initiation of the experiments, using short tandem repeat (STR) profiling (Supplemantary Table S4). All cell lines were maintained in DMEM culture media (BioWhittaker; Lonza Inc., Allendale, NJ, USA) supplemented with 10% fetal bovine serum (FBS) in a humidified atmosphere under 5% CO2 at 37°C. Cell viability was assessed by the blue titer fluorescent-based assay (resazurin; Promega, Madison, WI, USA), using Soft-Max Pro 5.4 software and the SpectraMax M5 microplate reader (Molecular Devices/Life Technologies, Carlsbad, CA, USA). Subconfluent cells were plated in a 96-well plate in the presence of 2% FBS-culture media (100 µL) and were allowed to adhere overnight. The following day, cells were treated with increasing concentrations (1 nmol/L to 2 µmol/L) of dacomitinib (100 µL added, with final concentration 1% FBS-culture media). After 72 h, 40 µL of resazurin (0.2 mg/mL) was added to each well (total volume 240 µL/well). In a separate experiment, UM-UC-6 cells were treated with a single dose of 2 µmol/L dacomitinib, or 2 µmol/L lapatinib, or 2 µmol/L (or 10 µmol/L) cetuximab and/or trastuzumab under the same conditions. Fluorescent readings from the plate reader were analyzed with GraphPad Prism 5.0. In a separate confirmatory experiment, to quantitate directly the number of viable cells 72 h after a single treatment of dacomitinib, cells were trypsinized (TryPLE), stained with trypan blue and counted using a hemocytometer. Baseline expression of EGFR, HER2 and HER4 was assessed after the collection of subconfluent concentrations of bladder cancer cells in the presence of 10% FBS culture media. Experiments were performed in parallel with cell viability experiments. Subconfluent UM-UC-3, UM-UC-6 and UM-UC-9 cells were plated in 10-cm well plates in the presence of 2% FBS culture media and were allowed to adhere overnight. The following day, cells were incubated with dacomitinib (0.02–2 µmol/L) for 5 h and then collected. In a separate experiment, subconfluent UM-UC-6 cells were plated in a 10-cm well plate in the presence of 10% FBS culture media and were allowed to adhere overnight. The following day, cells were collected or serum starved for 3 h, after which time 0.2 µmol/L dacomitinib or vehicle was added. After 3 h, EGF 10 ng/mL was added, and cells were collected 30 min later and treated with lysis buffer. The same amount of protein from each cell suspension was subjected to sodium dodecyl sulfate-polyacrylamide gel electrophoresis (SDS-PAGE) and then transferred to nitrocellulose membranes. After blocking with 5% bovine serum albumin/Tris-buffered saline with Tween-20 (BSA/TBST), the membrane was incubated with primary antibodies at 4°C overnight. Antibodies against phosphorylated EGFR (p-EGFR, Y1068), p—extracellular signal-regulated kinase (p-ERK) (T202/Y204) and p-Akt (S473) were purchased from Cell Signaling Technology (Danvers, MA, USA); anti-actin was purchased from Santa Cruz Biotechnology Inc. (Santa Cruz, CA, USA); anti-α-tubulin (clone DM1A | 05-829) was purchased from Millipore (Billerica, MA, USA); anti-EGFR (Ab-15, H9B4), anti-HER2 (Ab-17), and anti-HER4 (RB9045-P1) were purchased from Neo-markers Inc. (Fremont, CA, USA); and anti-E-cadherin (anti-E-cad) (#1702-1) was purchased from Epitomics (Burlingame, CA, USA). Blots were developed using chemiluminescence (Bio-Rad, Hercules, CA, USA) and were scanned using HP Scanjet 3670 (Hewlett-Packard Company, Palo Alto, CA, USA) for image acquisition. After incubation with 2 µmol/L dacomitinib for 24, 30 or 44 h, cells were centrifuged at 357 × g for 5 min, fixed in 70% EtOH, and stored at −20°C. Samples were washed with PBS and then dissolved in 0.5 mL PBS containing DNAase-free RNAase (100 µg/mL) and propidium iodide (50 µg/mL) and incubated at 37°C for 20 min in the dark. DNA content of cells was analyzed by FACSCalibur flow cytometer (BD Biosciences, San Jose, CA, USA) equipped with a ModFit LT program (Verity Software House, Topsham, ME, USA; https://doi.org/www.vsh.com/products/mflt/). After incubation with 2 µmol/L dacomitinib for 48 h, the degree of apoptosis was assessed using annexin V binding assay according to the manufacturer’s instructions (BD Biosciences). The harvested cell suspension was then incubated with Annexin V-APC and 7-AAD in annexin V binding buffer (1×) for 15 min at room temperature in the dark and then analyzed by flow cytometry. Apoptosis also was measured by the caspase 3/7 cleavage luminogenic assay (part of ApoTox-Glo Triplex Assay; Luminogenic DEVD-peptide substrate for caspase 3/7 and Ultra-Glo Recombinant Thermostable Luciferase, Promega), using 96-well plate and a plate reader, according to the manufacturer’s instructions; results were analyzed with GraphPad Prism 5.0. Six-month-old male nonobese diabetic/severe combined immunodeficiency (NOD/SCID) mice were injected subcutaneously (s.c.) with UM-UC-6 cells and were treated with dacomitinib 6 mg/kg or vehicle (0.05 N sodium lactate buffer, pH 4.0), via per os (PO; “by mouth”) gavage once daily, starting 1 d (early) or 1 wk (late) after cell inoculation (treatment duration was 4 and 3 wks, respectively). In addition, 6-wk-old male NOD/SCID mice were injected s.c. with UM-UC-9 cells and treated with dacomitinib 6 mg/kg or lapatinib 50 mg/kg or vehicle (0.05 N sodium lactate buffer, pH 4.0), via PO gavage once daily, starting 1 d (early for dacomitinib) or 1 wk (late for dacomitinib and lapatinib) after cell inoculation. Furthermore, UM-UC-6 xenografts were established in 7-wk-old NOD/SCID mice. A week after injection, the mice had palpable tumors, were randomized and treated with: (a) gemcitabine 50 mg/kg + cisplatin 2 mg/kg via three weekly intraperitoneal injections (IPI) + daily PO vehicle (0.05 N sodium lactate buffer, pH 4.0) for 3 wks; (b) da-comitinib 6 mg/kg PO daily for 3 wks + 3 weekly IPI of normal saline; (c) gemcitabine + cisplatin (same dose/schedule IPI) + dacomitinib 6 mg/kg PO daily for 3 wks, and 4) no treatment. Dacomitinib was not given on the days when chemotherapy was given, considering dacomitinib’s mechanism of action, which includes G1 phase arrest. The third dose of gemcitabine and cisplatin was 50% of the previous doses. The same treatments were performed in the UM-UC-9 xenografts, with exception that gemcitabine dose was 25 mg/kg and cisplatin was 1 mg/kg to avoid weight loss in the mice. In all experiments, mice were monitored daily, weighed weekly and euthanized after 4 wks of in vivo growth, at which time, the xenografts were weighed. Dacomitinib was prepared every week, aliquoted (15-mL polypropylene tubes) and stored at 4°C in the dark. Lapatinib was prepared at the time of treatment initiation, aliquoted (15 ml polypropylene tubes) and stored at −20°C in the dark. Gemcitabine and cisplatin were purchased in solution and stored at 4°C (gemcitabine), and room temperature (cisplatin) in the dark. University Committee on Use and Care of Animals (UCUCA) and Unit for Laboratory Animal Medicine (ULAM) guidelines were strictly followed according to institution’s policy (University of Michigan); the protocol was approved by UCUCA prior to study initiation. After the tumor was weighed, it was formalin-fixed and paraffin-embedded for generation of serial tissue sections, hematoxylin/eosin (H&E) staining and immunohistochemistry (IHC) for EGFR, HER2, Ki67, E-cad, p-EGFR (Y1068), p-ERK (T202/Y204), p-Akt (T308 or S473). Xenografts tissues were provided to the University of Michigan Comprehensive Cancer Tissue Core, Research Histology and IHC Laboratory, as well as to the University of Michigan Comprehensive Cancer Center Tissue and Molecular Pathology Core Research Laboratory. HER2, Ki67 and E-cad antigen retrieval was performed for 10 min in citrate buffer, pH 6.0, in a microwave, followed by 10 min cooling time and 10 min water wash. EGFR antigen retrieval required proteinase K for 10 min followed by buffer wash. Endogenous peroxidase was blocked for 5 min, followed by protein blocking for 5 min. Sections were next incubated with primary antibodies: anti-EGFR (Invitrogen/Life Technologies; 28-0005, 1:50, 1 h), anti-HER2 (Neomarkers, 1:200, 30 min), anti-Ki67 (Abcam, Cambridge, MA, USA; ab15580, 1:2000, 30 min), E-cad (Zymed/Life Technologies; 13-1700, 1:200, 30 min). Secondary antibody (LINK; Dako, Carpinteria, CA, USA) for 30 min and tertiary reagent (Streptavidin label; Dako) for 30 min were used for EGFR and E-cad. Secondary anti-mouse antibody (EnVision; Dako) for 30 min was used for HER2; secondary anti-rabbit antibody (EnVision; Dako) for 30 min was used for Ki67. Diaminobenzidine (DAB) for 5 min was used as chromogen. Nuclei were counter-stained with hematoxylin; positive control tissues were used. Sections from three tumors per treatment group also were provided to the University of Michigan Comprehensive Cancer Center Tissue and Molecular Pathology Core Research Laboratory to perform IHC for p-EGFR (Y1068), p-ERK (T202/Y204), p-Akt (T308 or S473). After microwave antigen retrieval in 1 mmol/L EDTA, pH 8.0, tissue sections were incubated with primary antibodies overnight: p-EGFR (BioCare Medical, Concord, CA, USA; #CME 300, rabbit, ready to use), p-Akt (T308 residue: Epitomics #3188-1, rabbit, 1:100; S473 residue: Epitomics #2214-1, rabbit, 1:100), p-ERK (Cell Signaling Technology, #4370, rabbit, 1:100). Immunostaining was performed on the DAKO Autostainer (Dako) using DAKO EnVision+ and DAB as the chromogen. Isotype antibodies were used as negative control, marker-positive breast cancer tissues were used as positive control. Each slide was evaluated and scored independently by two pathologists. Areas with the highest density of positive cells were selected at low power (20×) magnification. The number of positive stained cells was determined by visual inspection of several different fields per section at 100x magnification. For each field, the percentage of positive tumor cells was calculated and the average of those was taken. The intensity of staining was also evaluated and scored as weak (+1), moderate (+2), and strong (+3). Staining localization was documented (nuclear, cytoplasmic, membranous). All cell viability experiments were conducted in triplicate (three wells per treatment in a 96-well plate) and each experiment was conducted multiple times. To correlate cell viability for different treatments, a two-way analysis of variance (ANOVA) was performed including treatment and time. Cell cycle analysis and apoptosis data were compared with χ2 test (multiple experiments). Comparisons between xenograft treatment groups were performed by MannWhitney and Kruskal-Wallis nonparametric tests. Mann-Whitney test with multiple comparison adjustments was used for the analysis of chemotherapy-treated xenografts. Analysis was performed with GraphPad Prism 5.0; p < 0.05 was statistically significant. Prior to evaluating dacomitinib activity, we first assessed the expression of HER family proteins in our bladder cancer cell lines (UM-UC-3, UM-UC-6, UM-UC-9, UM-UC-13, UM-UC-14, RT4, T24, 5637) (data not shown). We noted that UM-UC-6 and UM-UC-9 expressed relatively higher levels of the dacomitinib targets, EGFR, HER2 and HER4 while UM-UC-3 exhibited lower levels of EGFR and HER2 and undetectable expression of HER4 (Figure 1). We selected these three cell lines for dacomitinib activity studies based on their differential expression of EGFR, HER2, HER4 and have summarized some of the molecular and phenotypic characteristics of these three cell lines in Supplemental Data (Supplemantary Table S1) (33). These cell lines were treated with increasing concentrations of dacomitinib over 72 h and cell viability was measured. Significant cytostatic effects were noted 72 h after a single treatment of dacomitinib at ≥50 nmol/L in UM-UC-6. The same effect was noted for ≥ 100 nmol/L in UM-UC-9 cells. UM-UC-3 cells were not as sensitive over the same concentration range (Figures 2A-C). Cell viability with 1 nmol/L and 10 nmol/L concentrations were similar to dimethyl sulfoxide (DMSO) in all cell lines (not shown) and with the 2 µmol/L concentration was similar to 1 µmol/L concentration (not shown). By comparing the activity of dacomitinib to cetuximab (anti-EGFR monoclonal antibody), trastuzumab (anti-HER2 monoclonal antibody) and lapatinib (dual anti-EGFR/HER2 tyrosine kinase inhibitor) in UM-UC-6 cells, we found that a single treatment of 2 µmol/L dacomitinib was superior to 2 µmol/L trastuzumab or 2 µmol/L cetuximab, but was not significantly different than the combination of 2 µmol/L cetuximab + 2 µmol/L trastuzumab (Figure 2D) or 2 µmol/L lapatinib (Figure 2E), suggesting that broader HER family targeting may be more effective compared with single receptor targeting. To confirm the inhibitory effect of dacomitinib on cell viability, we repeated this experiment using the trypan blue assay in UM-UC-6 and UM-UC-9 lines and noted a significant reduction in cell viability 72 h after a single treatment with dacomitinib (data not shown). Collectively, these data suggest that dacomitinib is effective against bladder cancer cells that express multiple HER family target receptors. 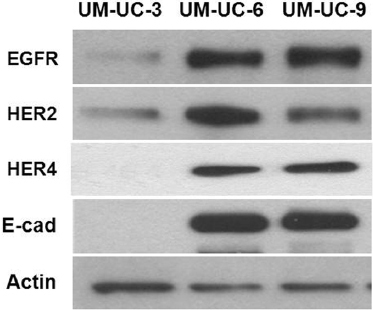 Baseline expression of EGFR, HER2, HER4 and E-cad protein in UM-UC-3, UM-UC-6, UM-UC-9 cell lines. (A-C) Viability of UM-UC-3, UM-UC-6, UM-UC-9 cells treated with different concentrations of dacomitinib was measured by the blue titer assay (fluorescent intensity units). Difference between dacomitinib concentrations ≥50 nmol/L (UM-UC-6), ≥ 100 nmol/L (UM-UC-9) and DMSO (control) was significant (p < 0.001; p < 0.05); difference was less significant in UM-UC-3 cells (p < 0.05). (D) Viability of UM-UC-6 cells treated once with 2 µmol/L dacomitinib (Dac), 2 or 10 µmol/L cetuximab (Cet), 2 or 10 µnmol/L trastuzumab (Tst), DMSO. Difference between each inhibitor versus DMSO was significant (p < 0.01) except for 2 µmol/L TST. Dac was superior to 2 µnmol/L TST (p = 0.0005), 2 µmol/L Cet (p = 0.042). Dac did not significantly differ than 10 µmol/L Cet, and combination of 2 µmol/L Cet + 2 µmol/L Tst. (E) Viability of UM-UC-6 cells treated once with 2 µmol/L dacomitinib, 2 µmol/L lapatinib, DMSO. Difference between each inhibitor versus DMSO was significant (p < 0.001); difference between inhibitors was not significant. (F) Apoptosis measured by caspase 3/7 cleavage luminogenic assay in UM-UC-6 cells treated with 2 µmol/L dacomitinib (Dac), DMSO (negative control), 0.5 µmol/L staurosporin (Sts; positive control). To characterize the activity of dacomitinib on bladder cancer cells, we evaluated effects on downstream HER-signaling pathways (ERK/MEK, PI3K/Akt/mTOR). In all three cell lines, dacomitinib inhibited baseline EGFR (Y1068) phosphorylation. In UM-UC-6 cells, dacomitinib also inhibited baseline ERK (T202/Y204), Akt (S473) phosphorylation, which corresponded to the reduction in cell viability (Figure 3). Moreover, dacomitinib (0.2 µmol/L) inhibited EGF-induced EGFR (Y1068), ERK (T202/Y204) and Akt (S473) phosphorylation in UM-UC6 cells (data not shown). These results suggest that dacomitinib exerts its effects via receptor target-driven signaling inhibition, at least in UM-UC-6 cells. UM-UC-3, UM-UC-6, and UM-UC-9 cells were treated once with increasing concentrations of dacomitinib (0.02 to 2 µmol/L for 5 h) or DMSO [untreated control (U)] (2% FBS-culture media). The effects on unphosphorylated and phosphorylated protein expression were measured by Western blot. In all three cell lines, dacomitinib inhibited baseline EGFR (Y1068) phosphorylation. In UM-UC-6 cells, dacomitinib also inhibited baseline ERK (T202/Y204), Akt (S473) phosphorylation. The expression of p-HER2, and unphosphorylated proteins appeared unaffected. The reduction in cell viability induced by dacomitinib may result from several biological mechanisms. To address this question, we treated cells with 2 µmol/L dacomitinib or DMSO and collected cells for cell cycle analysis. UM-UC-6 and UM-UC-9 cells showed consistent increases in the G1 phase compared with S and G2 phases at 24, 30 and 44 h after a single treatment (Table 1). Increased G1 accumulation was significant in UM-UC-6 cells at 24 h and 30 h, but only at 44 h in UM-UC-9 cells, corresponding to relatively longer cell doubling time of UM-UC-9 cells. We also evaluated the effect on apoptosis in both cell lines 48 h after a single treatment with 2 µmol/L dacomitinib or DMSO. Apoptosis of UM-UC-6 cells increased with treatment; however, apoptosis of UM-UC-9 cells did not increase significantly. Both cell lines exhibited significant necrosis with treatment (Table 2). The apoptotic effect on UM-UC-6 cells was confirmed by caspase 3/7 cleavage (Figure 2F). These data suggest that induction of apoptosis and G1 arrest are two mechanisms of dacomitinib antitumor activity in bladder cancer cells. Flow analysis of cell cycle in dacomitinib-treated cells. UM-UC-6 and UM-UC-9 cells were analyzed by flow cytometry following a single treatment of 2 µmol/L dacomitinib (Dac) or equivalent concentration of DMSO. The resulting % of gated cells is indicated following 24 h and 44 h of treatment. Differences in UM-UC-6 treated with dacomitinib compared with DMSO were significant at 24 h (p < 0.0001). In UM-UC9 cells, this difference was only significant at 44 h (p = 0.02). To assess the antitumor activity of dacomitinib in vivo, UM-UC-6 or UM-UC-9 xenografts were established in NOD/SCID mice. Forty-five mice were randomized in three groups in the UM-UC-6 xenograft experiment (15 mice/group), and 40 mice in four groups in the UM-UC-9 experiment (10 mice/group). Treatment with dacomitinib (early and late) or lapatinib (late) was well tolerated in mice without significant morbidity or mortality (Supplemantary Table S2). Following 4 wks of in vivo growth, the xenografts were excised and weighed. Weights of both UM-UC-6 and UM-UC-9 xenografts were significantly lower in dacomitinib-treated compared with vehicle-treated mice (Figures 4A, B). Three dacomitinib-treated mice had no tumor at 4 wks. In the UM-UC-6 xenograft, the reduction in the tumor weights corresponded to inhibition of EGFR (Y1068) and ERK (T202/Y204) phosphorylation, and reduction of E-cad expression (Figure 5A), as analyzed by IHC. Akt (T308 or S473) phosphorylation did not appear to differ significantly between vehicle-and dacomitinib-treated UM-UC-6 xenografts (data not shown). Additionally, there appeared to be less tumor epithelium and more stroma in the dacomitinib-treated UM-UC-6 xenografts (see Figure 5A). A summary of the effects of dacomitinib on UM-UC-6 tumor bio-markers is presented in Table 3. Importantly, dacomitinib resulted in significantly lower UM-UC-9 xenograft weights compared with lapatinib (see Figure 4B). There was no significant difference in the expression of the evaluated biomarkers in dacomitinib-treated UM-UC-9 xenografts. Staining localization was membranous for EGFR, HER2 and p-EGFR; cytoplasmic for E-cad; nuclear for Ki-67; nuclear and cytoplasmic for p-Akt and p-ERK. These results suggest that dacomitinib exhibits pronounced in vivo effects against bladder cancer xenografts, and is associated with target-specific pharmacodynamic changes in the UM-UC-6 xenografts. (A) Age-matched male NOD/SCID mice were injected subcutaneously with UM-UC-6 cells and were treated with dacomitinib (Dac) 6 mg/kg or vehicle (0.05 N Na lactate buffer, pH 4.0; PO once daily), starting 1 d (early) or 1 wk (late) after injection. Xenografts weights were lower in Dac versus vehicle (p < 0.001) (B) Age-matched male NOD/SCID mice were subcutaneously injected with UM-UC-9 cells and were treated with Dac 6mg/kg or lapatinib (Lap) 50mg/kg or vehicle PO once daily, starting 1 d or 1 wk after injection. Xenografts weights were lower in Dac versus vehicle (p < 0.001). Dac resulted in significantly lower tumor weights versus Lap (p = 0.0052). (C) UM-UC-6 xenografts were established in age-matched NOD/SCID mice, which were treated a week after cell injection. Tumor weights were significantly lower with Dac, and gemcitabine-cisplatin (GC) + Dac versus no treatment (No Tx) (p < 0.0001) or versus GC (p < 0.0001). (D) The same experiment was performed in UM-UC-9 xenografts. Tumor weights were significantly lower with Dac (p = 0.002; 6-x reduction) or GC (p = 0.0006; 7-x reduction) versus no treatment (No Tx). GC + Dac-treated xenografts had significantly lower weights versus GC (p = 0.005), Dac (p = 0.06) or no treatment (p < 0.0001; 17-fold reduction). Flow analysis of apoptosis in dacomitinib-treated cells. UM-UC-6 and UM-UC-9 cells were analyzed by flow cytometry following a single 48-h treatment of 2 µmol/L dacomitinib (Dac) or equivalent concentration of DMSO. Resulting percentage of gated cells is indicated. 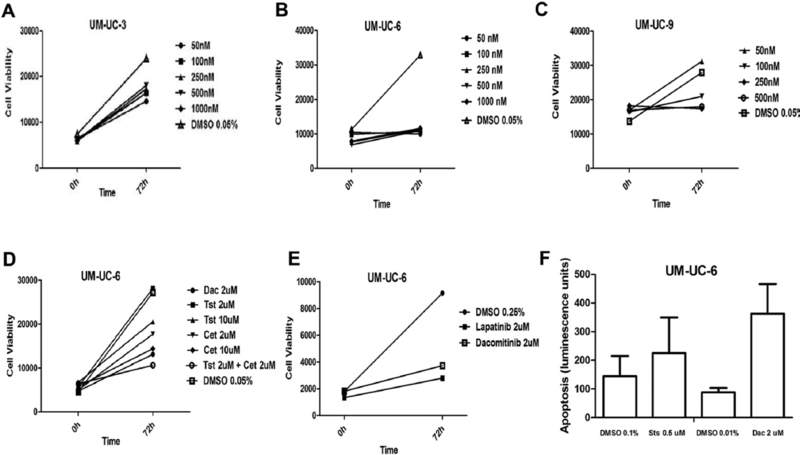 Dac induced apoptosis in UM-UC-6, but not in UM-UC-9 cells compared with DMSO treatment. The percentage of necrotic cells increased in both cell lines; 0.5 µmol/L staurosporin (Sts) was used as positive control for apoptosis (p < 0.0001). Immunohistochemical analysis of biomarkers expression in UM-UC-6 xenografts. Three representative tumors were selected from treatment groups (V1-3) vehicle alone, (E1-3) early dacomitinib and (L1-3) late dacomitinib. Mitotic count is shown as number per high powered field (HPF). % of cells staining is indicated. Fifty-five mice were randomized in four groups and treated with dacomitinib (15), gemcitabine-cisplatin chemotherapy (15) or their combination (15); ten mice had no treatment. Two mice treated with gemcitabine—cisplatin regimen alone experienced >20% weight loss with one of these mice dying after the third chemotherapy dose (tumor weight was 7.4 mg). Overall, mice tolerated all treatments well without significant adverse events (Supplemantary Table S3). Xenograft weights were significantly lower with dacomitinib alone and dacomitinib + chemotherapy compared with no treatment or compared with chemotherapy alone (Figure 4C). Xenografts treated with chemotherapy alone had similar weights to those with no treatment. Five mice treated with dacomitinib alone and three mice treated with dacomitinib + chemotherapy had no tumor at 4 wks. Dacomitinib resulted in significantly decreased p-ERK (T202/Y204) expression and staining intensity compared with chemotherapy alone or no treatment (Figure 5B), with no significant differences in the expression of the other biomarkers. Results imply that dacomitinib alone exhibits dramatic activity in chemotherapy-resistant bladder cancer xenograft. Dacomitinib + chemotherapy combination is feasible and well tolerated by NOD-SCID mice. (A) Three tumors/group from the first UM-UC-6 in vivo experiment were selected for H&E and IHC evaluation for EGFR, HER2, Ki67, E-cad, p-EGFR (Y1068), p-ERK (T202/Y204), p-Akt (T308, S473). Dacomitinib resulted in inhibition of EGFR (Y1068) and ERK (T202/Y204) phosphorylation, as well as reduction of E-cad expression. (B) Three tumors/group from the second UM-UC-6 in vivo experiment underwent biomarker evaluation. Dacomitinib resulted in significantly decreased p-ERK (T202/Y204) expression and staining intensity versus chemotherapy or no treatment. Forty-four mice were randomized in four groups and treated with dacomitinib alone (11), gemcitabine—cisplatin chemotherapy (11) or their combination (11); 11 mice had no treatment. Overall, mice tolerated all treatments without significant treatment-related morbidity and mortality (Supplemantary Table S3). Xenograft weights were significantly lower with dacomitinib (six-fold reduction) or chemotherapy alone (seven-fold reduction) compared with no treatment (Figure 4D). Dacomitinib + chemotherapy resulted in lower tumor weights compared with chemotherapy alone, dacomitinib alone, or no treatment (17-fold reduction). These results confirm that combination of dacomitinib + chemotherapy is well tolerated and significantly increases the effect of chemotherapy alone in UM-UC-9 xenografts. There was no significant difference in the expression of biomarkers evaluated by IHC, with the exception of slightly higher expression of p-Akt (S473) in all active treatments compared with no treatment (data not shown). Human epidermal receptors show promise as therapeutic targets in bladder cancer. Recent preclinical studies have suggested that available HER inhibitors exert antitumor activity (1,34, 35, 36, 37); however, clinical studies have not shown meaningful clinical efficacy (25,26). The absence of biomarker-based patient selection and the sequence of chemotherapy and targeted therapies could affect results. Other potential factors include differential receptor heterodimerization, inadequate potency, poor efficacy and reversible binding of the targeting compounds, activation of alternative signaling pathways that mediate resistance. Considering those factors, we tested a novel, potent, irreversible pan-HER tyrosine kinase inhibitor, dacomitinib, in preclinical models of human bladder cancer. Dacomitinib demonstrated dramatic in vitro and in vivo antitumor activity as a single-agent. Cytostatic effects were noted with a single treatment of 50 nmol/L in UM-UC-6 and 100 nmol/L in UM-UC-9 cells, which translates to pharmacologically applicable in vivo human dosing. UM-UC-3 cell viability was less affected, possibly corresponding to differential target protein expression. When compared with an equal concentration of other anti-HER compounds in UM-UC-6 cells in vitro, a single treatment of dacomitinib (highest in vitro tested concentration) was more active compared with cetuximab or trastuzumab, and equivalent to lapatinib. 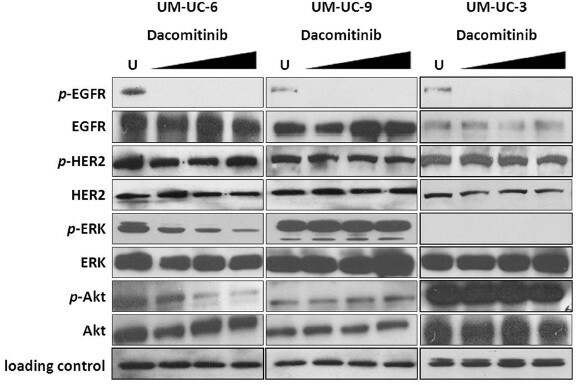 Direct comparison in UM-UC-9 xenografts demonstrated dacomitinib superiority over lapatinib. This could be explained by broader inhibitory activity (for example, HER4), higher potency (lower IC50 for EGFR and HER4), irreversible receptor binding and/or differences in bioavailability. 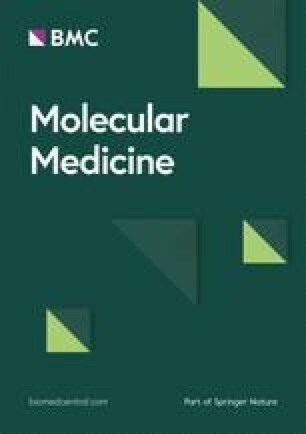 The role of HER4 in bladder cancer merits further investigation, considering that heterodimerization of HER monomers can result in receptor activation, cell proliferation, growth, survival and persistent oncogenic signaling, while it can circumvent monomer inhibition in bladder cancer (35, 36, 37). However, HER4 gene has not been shown to be characteristically amplified or mutated in human bladder cancer (20,21). Concurrent inhibition of EGFR/HER2 was shown to overcome resistance to cetuximab in a novel in vivo model of acquired cetuximab resistance (38). Dacomitinib also was shown to overcome acquired resistance to HER inhibitors in several other carcinomas (30,31,39), implying that broader HER family inhibition may result in more robust signal abrogation. Another consideration is the different mechanism of action between monoclonal antibodies and tyrosine kinase inhibitors. The former (for example, cetuximab, trastuzumab) bind to the extracellular domain and inhibit receptor-driven signaling. The latter bind to the intracellular catalytic domain and inhibit kinase activity, usually by competitive inhibition of the ATP-binding site. This differential mechanism might potentially account for differential effects on cells, for example, in the presence of tyrosine kinase mutations; however, EGFR or HER2 mutations have not been reported as frequent in human bladder cancer (20,21). Dacomitinib inhibited the residue-specific phosphorylation of EGFR and its downstream signaling (ERK, Akt) in UM-UC-6 cells, and resulted in G1 arrest and induction of apoptosis. Interestingly, there was no inhibition of HER2 phosphorylation. UM-UC-9 cells have a mutated p53, which could render them resistant to dacomitinib-induced apoptosis, but can be susceptible to growth arrest. UM-UC-3 cells have phosphatase and tensin homolog (PTEN) deletion, which can explain their robust p-protein kinase B (p-AKT) expression. The differential effects on downstream signaling could be explained by the dynamic “cross-talk” among signaling pathways that can differ substantially among cell lines. For example, in UM-UC-6 cells, ERK and Akt pathways signaling appear to provide a pharmacodynamic correlative of response to dacomitinib. Interestingly, HER-downstream signaling seems to be pertinent in human bladder cancer specimens (20,21). Our findings correspond to similar observations derived from dacomitinib treatment of several carcinoma models, (lung, biliary, gastric and breast) confirming that G1 arrest and induction of apoptosis are two mechanisms of antitumor activity regardless of cancer cell type (29, 30, 31). Evaluation of alternate mechanisms (autophagy and/or anoikis) also could be explored in the future. Considering the role of epithelial markers such as E-cad regarding response to HER inhibitors such as cetuximab (40), we evaluated the expression of E-cad after treatment in xenografts. We observed a reduction in E-cad expression that correlated with a reduction in tumor size and in the epithelial component in the UM-UC-6 xenograft. In our clinical trial evaluating the addition of cetuximab to chemotherapy, we noted a reduction in the serum level of soluble E-cad, possibly related to the targeting of tumor epithelial cells (25). However, further mechanistic work is warranted to explore E-cad as a pharmacodynamic and/or predictive biomarker in this disease. Our findings may have important clinical implications, considering clinical data with HER inhibitors. The addition of cetuximab to gemcitabine-cisplatin chemotherapy did not increase the response rate, progression-free or overall survival in a randomized phase II trial in 88 patients with advanced urothelial carcinoma (25). Lapatinib in 34 patients with advanced urothelial cancer who had progressed on platinum therapy resulted in one objective response with 18 patients having stable disease (26). However, clinical benefit correlated with tumor EGFR and HER2 overexpression, suggesting that biomarker-based patient enrichment is important. In patients receiving lapatinib, EGFR and/or HER-2, tumor overexpression was associated with longer median survival. In another study of 44 patients with HER2-positive urothelial cancer, trastuzumab combined with paclitaxel, carboplatin, gemcitabine chemotherapy resulted in 70% response rate (34). Our findings combined with previous clinical studies imply that a selected patient subset may benefit from HER-targeted therapies. This is supported by the significant correlation between HER2 gene amplification and sensitivity to dacomitinib in gastric and breast cancer cell lines (31,32). Nonetheless, HER overexpression may not be sufficient for tumor response to HER inhibitors. Further understanding of resistance mechanisms to these inhibitors can elucidate biologically relevant biomarkers and inform combinatorial treatment strategies. Evaluation of possible off-target effects, for example, angiogenesis, also should be explored. In vivo models provide more clinically applicable information than in vitro platforms. Considering the complexities and difficulties of orthotopic models of urothelial cancer in mice, we tested the activity of dacomitinib in subcutaneous xenografts, as described previously (41). The decision for early and late treatment aimed to model two distinct disease settings: minimal residual disease/malignant cells (“adjuvant” setting) and palpable tumors, as described previously (42). We elected to initiate treatment at the time points of 1 d and 1 wk, based on our prior experience with the very rapid growth of tumor xenografts. Future studies should include evaluation of additional bladder cancer cell lines with differential molecular and phenotypic features, as well as orthotopic and genetically engineered bladder cancer xenografts when those become established and validated. Evaluation of alternative treatment schedules and time point of treatment initiation, as well as identification of biomarkers predictive of response and mechanisms of resistance will be critical to guide optimal clinical translation. Gemcitabine—cisplatin chemotherapy is the standard first-line therapy in advanced bladder cancer (43). However, apart from its toxicity, responses are not durable, and almost all patients relapse and ultimately die from the disease. There is no FDA-approved second line therapy in the US, while HER overexpression is thought to mediate chemotherapy resistance and/or disease progression. In this study, dacomitinib established profound activity in chemotherapy-resistant UM-UC-6 bladder cancer xenografts. In addition, the combination of dacomitinib + chemotherapy was feasible and tolerable, and was superior to chemotherapy alone in the chemotherapy-sensitive UM-UC-9 xenografts. Hence, our findings led to the development of a phase I clinical trial concept that aims to evaluate the safety, feasibility and recommended phase II dose of the combination gemcitabine—cisplatin regimen with dacomitinib as a first-line therapy in patients with HER-expressing advanced bladder cancer. When launched, this would be the first trial in humans to assess dacomitinib with gemcitabine-cisplatin. In conclusion, our results demonstrated substantial single-agent activity of dacomitinib in in vitro and in vivo models of human bladder cancer. The antitumor activity of dacomitinib correlated with the expression of HER target receptors and inhibition of downstream signaling pathways culminating in G1 cell cycle arrest and the induction of apoptosis. Furthermore, the combination of dacomitinib with gemcitabine—cisplatin chemotherapy was found to be feasible, safe and superior to gemcitabine—cisplatin regimen alone. M Hussain has received research funding from Pfizer Inc. for research unrelated to this project; ML Day has received research funding from Eli Lilly for research unrelated to this project. The authors would like to thank Pfizer Inc, Alan Kraker, Greg Shelley, Stephanie Daignault, Anosike Nwokoye, Steven Wilson, Evan Keller and David C Smith. Supplementary material, approximately 85.2 KB.